“We’re going to have to ditch, sir, prepare for a landing on water!” was the last thing that the “Unkillable Soldier” Major-General Adrian Carton de Wiart VC heard from the cockpit of the Wellington bomber that was supposed to be taking him to Yugoslavia. Some men have no fear of death, while others have no fear of personal injury. One man snubbed his nose at both, which was why he fought for almost half a century; bearing scars from nearly every war he fought in. He looked tough, even in retirement. 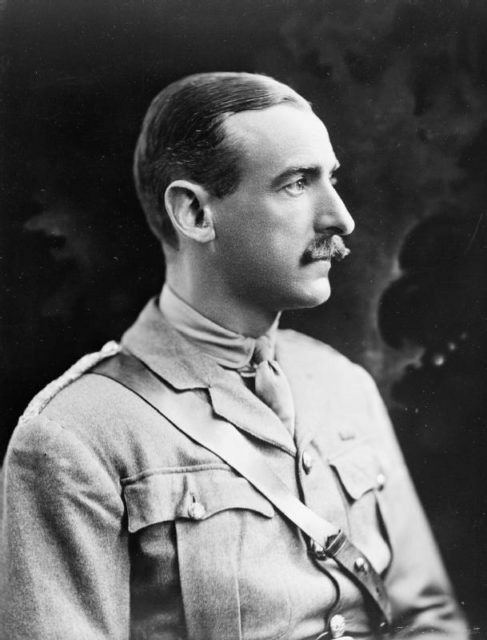 Adrian Paul Ghislain Carton de Wiart was born on May 5, 1880, in Brussels, Belgium to an aristocratic family on his father’s side. His mother was Irish, and it off he was the illegitimate son of King Leopold II of Belgium. 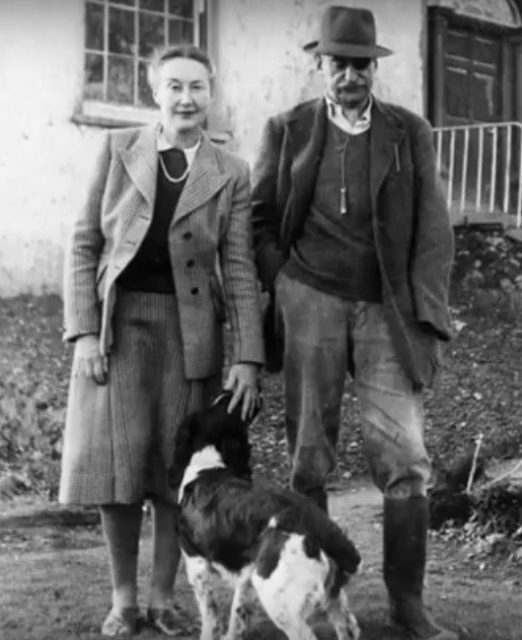 The young Wiart spent his childhood between Belgium and Britain until he was six when his mother died. The family moved to Cairo, Egypt where his father practiced international law. A few years later, the old man remarried and his new wife sent Wiart back to England to live in a boarding school. From there, he went on to college, although not for long. On October 11, 1899, ongoing tensions between the Dutch and the British in South Africa exploded with the Second Boer War. Although barely 20, Wiart dropped out of school to join the British Army. He claimed to be 25 and enlisted under the name “Trooper Carton.” He was shot in the stomach and groin and sent back to England. That was when his family found out he had become a dropout, and his father was not happy. 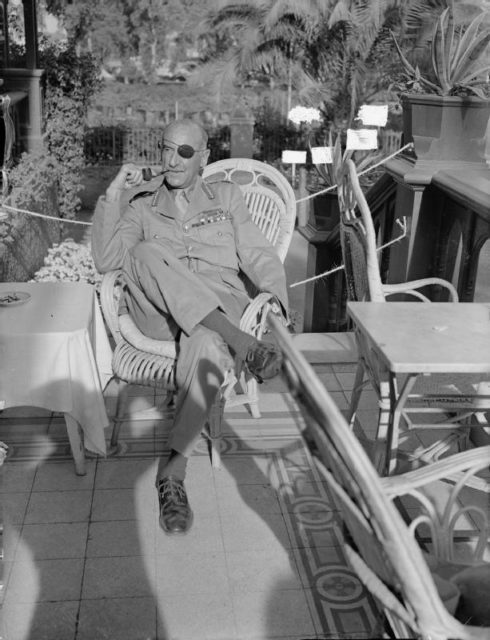 Adrian Paul Ghislain Carton de Wiart in South Africa as Commanding Officer of the 8th Battalion, 4th Dragoon Guards. Wiart held no grudge against the Dutch. He claimed if the British had not taken him, he would have fought for the other side. He later joined the Second Imperial Light Horse and was sent back to South Africa. By September 1901 he was a second lieutenant in the 4th Dragoon Guards. With the Dutch defeat in May 1902, Wiart spent some time in India before he was sent back to South Africa in 1904. Two years later, he became a naturalized British subject. 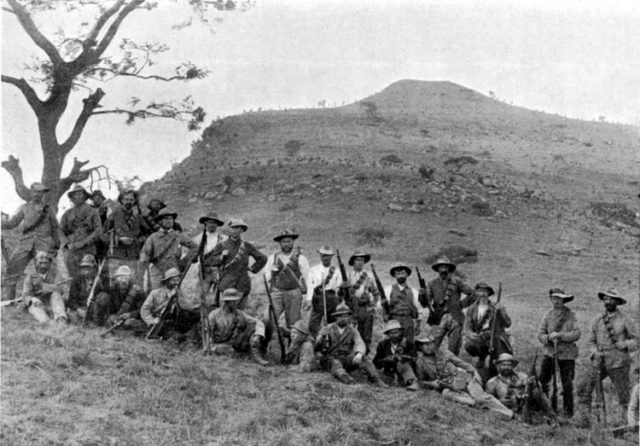 Boer militia in South Africa in 1900. WWI found him in British Somaliland fighting a religious militia that wanted to establish a Dervish State; leading to a twenty-year war against Britain, Italy, and Ethiopia. Wiart was a staff officer with the Somaliland Camel Corps when he received his first award. The Dervishes had built forts throughout Somaliland to harass the Europeans and the Ethiopians. On November 17, Wiart’s corps attacked one of the forts at Shimber Berris. They failed. The defenders shot Wiart twice in the face; taking out his left eye and part of his left ear. He was awarded the Distinguished Service Order on May 15, 1915. Back in England, the staff at Sir Douglas Shield’s Nursing Home knew they would be seeing more of him when he expressed delight over his injuries. He claimed it was just what he needed to get to the Western Front where the real fighting was taking place. They kept his pajamas just in case. 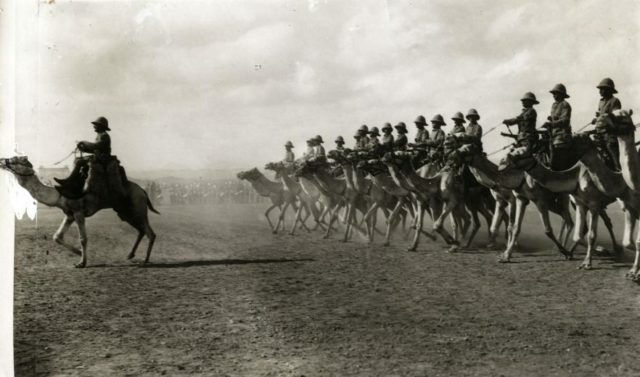 British Camel Troopers in Somaliland in 1913. During the Second Battle of Ypres (April to May 1915), his left hand was mangled by an artillery barrage. The doctor insisted he could save some of it, but Wiart could not wait – two fingers gave him so much pain he bit them off. Bowing to the inevitable, doctors at Shield’s amputated the entire hand. It was during the Battle of the Somme he got the Victoria Cross; Britain’s highest military award. Wiart was a Lieutenant-Colonel in the 4th Dragoon Guards, Gloucestershire Regiment at La Boiselle. From July 2 to 3, 1916, he held his ground despite the loss of three other battalion commanders; as well as part of his skull and ankle. 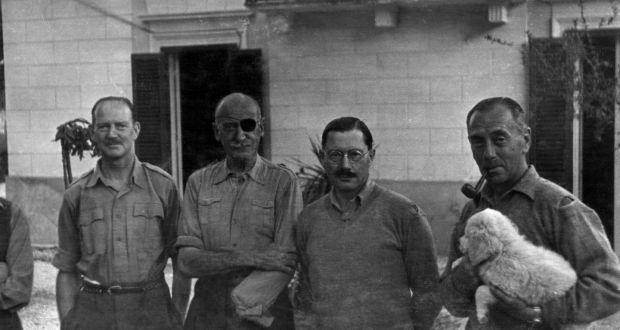 From left: Brigadier John Combe, Major-General Adrian Carton de Wiart, Brigadier Edward Todhunter & Major-General Michael Gambier-Parry (camp forger) holding puppy Mickey. It did not end there. He was also shot in the hip at the Battle of Passchendaele (July to November 1917). What remained of his left ear was shot of at the Battle of Arras (April to May 1917), and he was shot in the leg at the Battle of Cambrai (November to December 1918). 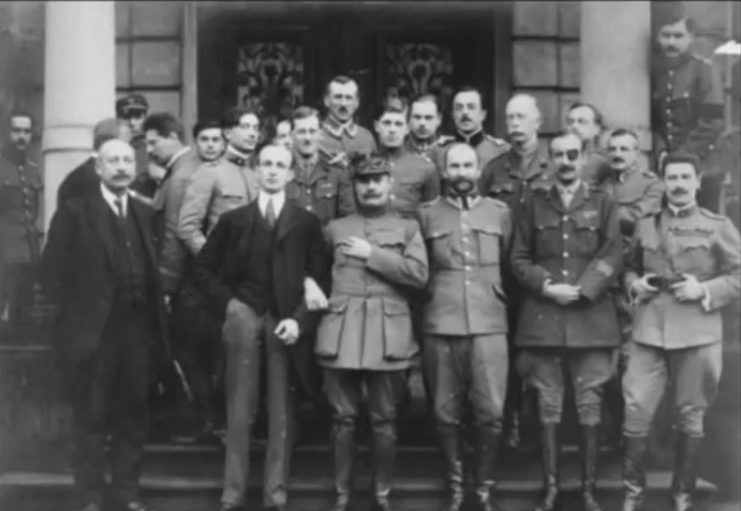 de Wiart in Poland in 1919. He then became second-in-command of the British-Poland Military Mission. One of his jobs was to broker peace between the Poles and everyone else during the Polish-Soviet War, the Polish-Ukrainian War, Polish-Lithuanian War, and the Czech-Polish Border Conflicts. The Mission failed. Worse, his plane crashed in Lithuania where he became a guest at one of their prisons. Later released, he pleaded with Churchill (then Secretary of State for War) to help the Poles. In August 1920, he was returning to Warsaw when his train was attacked by the Red Russian cavalry, resulting in a gun battle. Although he fell off the train, he did get back on again with no serious injuries, so Shield’s must have missed him. Wiart retired from the military as a Major General in December 1922 to a country estate in Poland close to the Soviet border. Until WWII broke out. 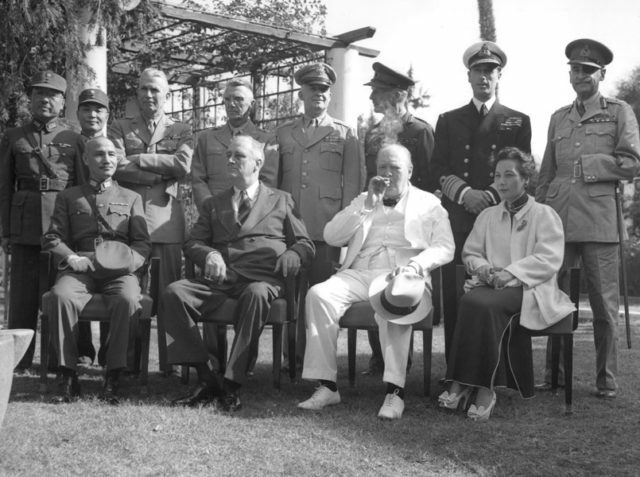 Wiart (standing at far right) at the Cairo Conference in November 1943. The joint German-Soviet invasion of Poland forced him to lead the Mission he had retired from to neutral Romania. Along the way, a German plane killed one of his staff; leaving him miraculously unscathed. Romania was not safe either, so he returned to Britain and active service, becoming an Acting Major-General in November 1939. In April 1940, he led an Anglo-French attack on the Norwegian town of Nasmos where his plane was shot at by a German aircraft. Their ultimate goal was Trondheim, but they had to retreat. He was sent to Northern Ireland to prepare for a German attack on May 5, 1940 – his 60th birthday. It was only then it was realized he was too old. He was made the head of the British-Yugoslavian Military Mission on April 5, 1941, but never made it. 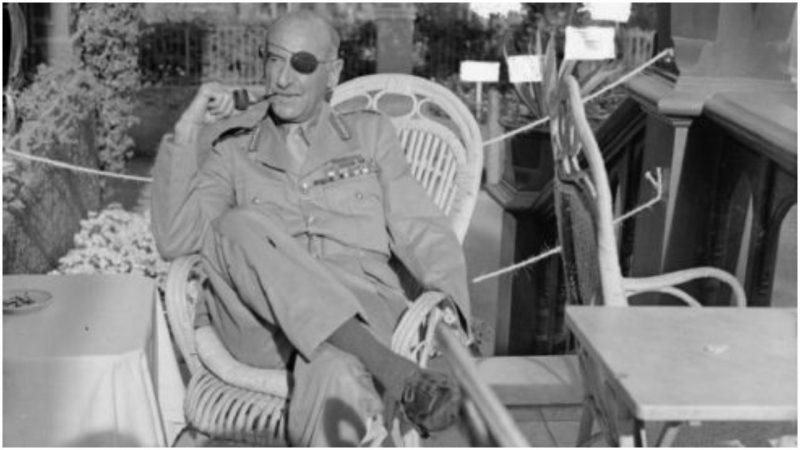 Wiart in Cairo, Egypt in 1943. His plane crashed, and instead, he became a guest of the Italians. He tried escaping several times and got away once before they caught him eight days later. He was finally released in August 1943 when the Italians switched sides to join the Allies. By October, he had become Churchill’s personal representative to China where he met Mao; whom he did not like. He much preferred Chiang Kai-shek who offered him a job with his government. 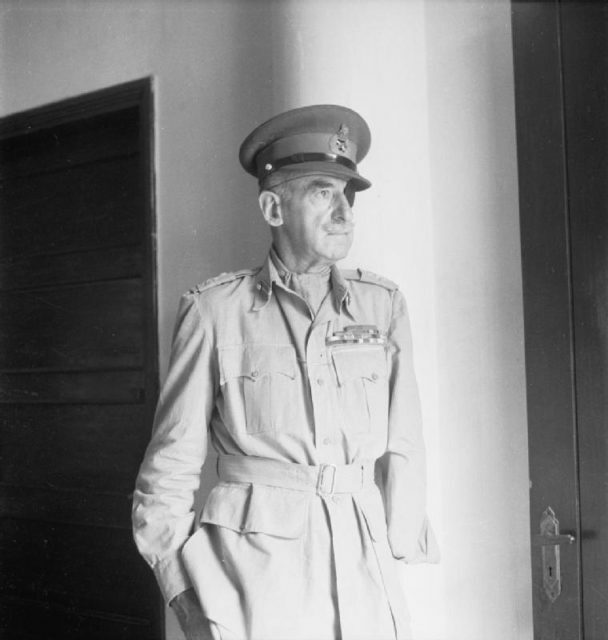 Wiart was now 66, so he finally retired in October 1947 as a Lieutenant-General. On his way back to Britain, he stopped by Rangoon, Burma where he fell and broke his back. During the operation, Shield’s doctors took out some shrapnel that had been there from previous skirmishes. Typically, he survived and spent his remaining years in Ireland where he truly retired on June 5, 1963, at the age of 83.